At Complete Corporate Wellness our programs are carefully designed to your work culture, your needs and your budget. They are always holistic in consideration taking our EAT, MOVE, THINK philosophy. Practitioners will travel onsite to provide a wide range of health assessments, allowing staff to experience a Wellness centre without leaving the office. Our signature "Pop up Health Centre" is like no other, we create the atmosphere, service and care of a real wellness centre at your workplace. Our Complete Corporate Lifestyle check will cover all aspects of our EAT, MOVE, THINK philosophy, allowing your staff a better understanding of their health status. Fun, interactive and highly engaging seminars or webinars that will leave the audience informed and motivated. Download some of our most popular topics, however if you have other topics you would like covered please let us know and we can customized this for you. Make a real difference to your employee’s health by not only testing for health problems but also treating them! Onsite practitioners will spend time at your workplace providing treatment. Build resilience and mindfulness in your workplace. Our holistic programs covers all aspects of mindfulness from resilience, job satisfaction, mental health, emotional intelligence and more. Our unique 5 senses travelling meditation centre, with lounges, silent disco headphones, aromatherapy and homeopathy will leave staff relaxed and stress free. Our Ergonomic assessments are one of a kind, with not only workstation advice but a complete computerised spine and posture assessment, making sure the individual also corrects their posture at work. This helps prevent injuries, pain and RSI problems. Handouts and exercise prescription is included with each ergonomic assessment. All of our instructors are qualified and with years of experience. Healthy competition among workmates is good especially if it involves healthy habits. Have fun, build teamwork, and make stronger connections with our EAT, MOVE, THINK challenges. Mindfulness challenge and many more. 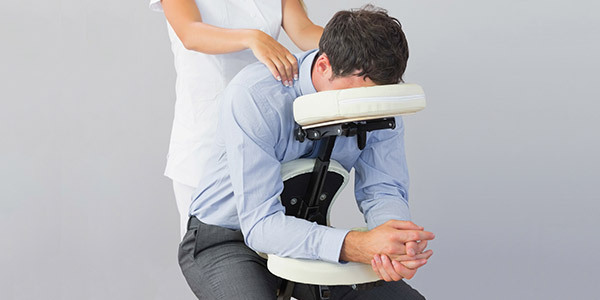 Allow our Massage Therapist to relax your tired and achy muscles while you are at work with our Seated Massages. As part of Complete Corporate Wellness’s programs we provide this amazing app that caters to your company’s program and health and wellness goals. Our EAT, MOVE , THINK philosophy embraces all aspects of wellness, inspiring the individual to reach their health and wellbeing potential. This app will allow you to access your workplace health events, assessment results, join challenges and keep up with your health and fitness. This will create a productive and energised workplace. Would you like to reward, engage and connect with your workmates? Our Corporate Retreats are unique as your team. The focus is on connecting and creating a healthy company culture. Our amazing venues, great healthy food especially designed by our Chef and our health programs will leave your team productive and energised.